Admit it – you’ve probably asked yourself “How do I become a millionaire?” more than once in your life. Don’t be shy! With all the images of happiness and security we see associated with wealth, how could you (or most anyone) not. Regardless of what your actual financial goals are, the act of having a net worth of one million dollars or more is still heavily regarded as quite an accomplishment! In fact, in a survey conducted by investment service Charles Schwab, less than 10% of Americans had accumulated a net worth of $1 to $5 million. So while 10% may sound like a small sliver of the population, keep in mind that this represents 9.4 million individuals. Is there any reason you couldn’t become one of them? Of course you could! Most of these people are not at all what you’d expect. In the book “The Millionaire Next Door”, the illusion that a millionaire is always some type of power-seeking, high-ranking executive is dismissed. 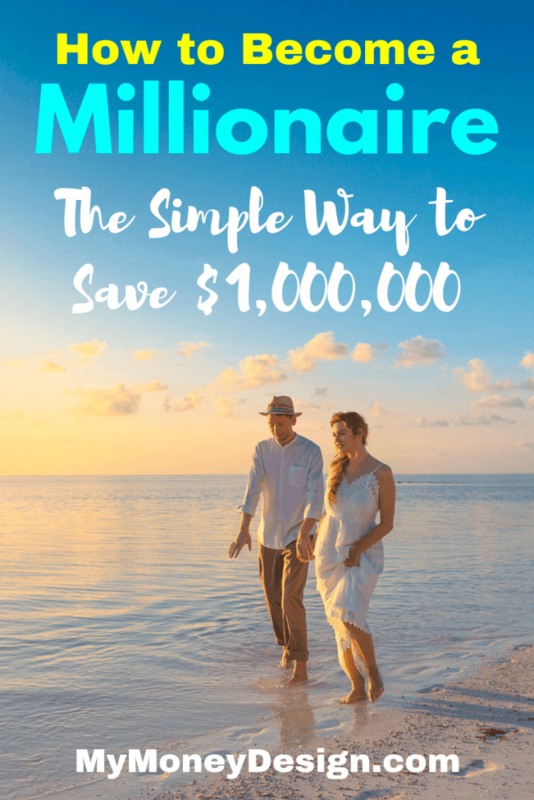 The reality is that most of the people who have reached millionaire status are simply working-class couples who used a few simple, yet effective strategies to save their way to this goal! What kind of strategies do I mean? Again, they won’t include day-trading stocks or buying a power-suit for your big move to Wall Street. 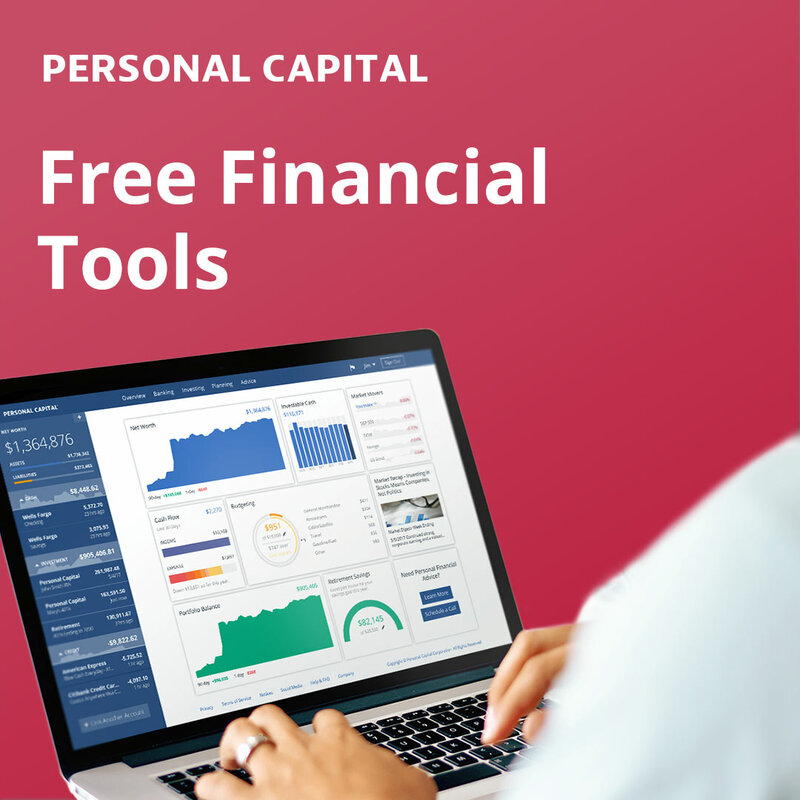 Instead, in this post, we’ll cover how ordinary people like you and I use simple savings and investing habits to build our own personal fortunes. So with that said, let’s learn about what it takes to become a millionaire! Despite what you may think about how to become a millionaire, the path to getting there starts with leveraging one of the simplest assets we all have: Time. That’s right. Your first step to accumulating your first million dollars (and beyond) starts with understanding how time can be one of your most powerful tools. The secret comes in using something called compounding returns. Compounding returns are the money that builds on top of the money you earn year after year. You can find a whole article I wrote on how compounding returns work here. As the name implies, this combination of your principal savings plus the earnings will “compound”. In the beginning when you first start to invest, your earnings won’t feel like very much. But over the years, as you accumulate more and more money, the earnings will grow in size as the volume of your fortune increases year after year. Eventually, the earnings becomes so great that you’re actually making more money off of the earnings than you are from your initial principal investments. An investment account with $10,000 earning will 10% will increase by $1,000 for the year. An investment account with $500,000 earning will 10% will increase by $50,000 for the year. 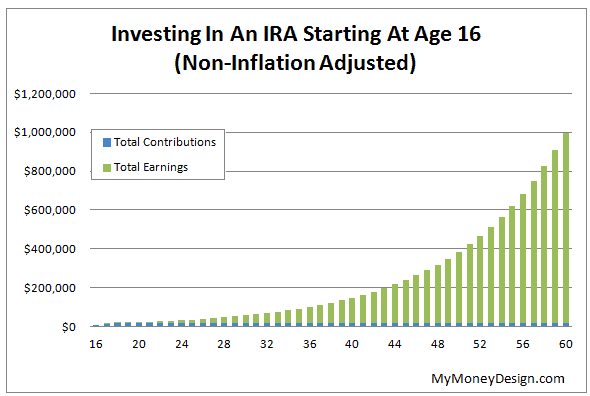 To give some idea of how powerful the effects of compounding returns can be, check out this post I wrote about encouraging your children to start a Roth IRA as a teenager. In this example, an initial savings of just $16,500 as a teenager would have had the potential to grow into nearly one million dollars by the time that person was 60 years old. Got some numbers of your own you’d like to experiment with? 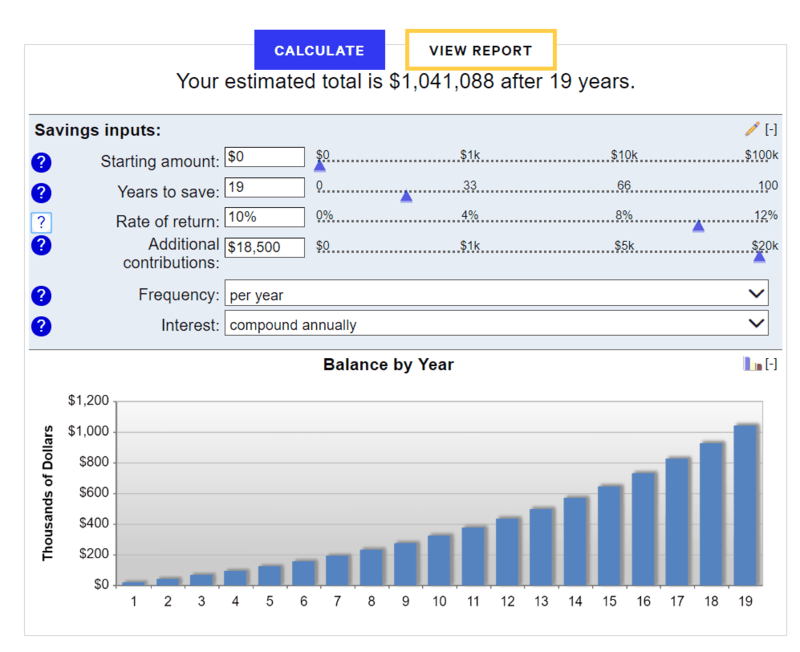 You can try them yourself using this simple, free online compound interest calculator from BankRate. The bottom line: If you want to reach millionaire status someday, you need to put compounding returns to work. Its how you will be able to grow your savings above and beyond what you could ever save under your mattress. The more you save, the earlier you start, and more time you give it, the better it will be! What Should I Invest In To Become a Millionaire? Okay … so if using compounding returns is REALLY so simple, then why aren’t more people millionaires? Because in order for compounding returns to be truly effective, there needs to be a reasonably high rate of return on your investment. And its finding such an investment where people can get themselves into trouble if they head down the wrong the path. Unfortunately, relatively “safe” investments like savings accounts and CD’s don’t pay very exciting interest rates. At the 2-percent or so that I last saw online savings accounts and CD’s advertised, its going to take you a VERY long time before you’ll ever see a million dollars. To accelerate the process, we’re going to need an investment that pays a bit higher. We’re talking in the 5 to 10% range. So what should you invest in? In order to build towards becoming a millionaire faster, what’s something you can manage yourself and still get a reasonably high rate of return? Don’t freak out. Remember, I already told you that you’re not going to have to become a day-trader. Nor am I going to have you analyzing any zig-zagging charts or reading the Wall Street Journal. Another one of the big secrets of investing is that the most effective way to capture the power of the entire stock market is to invest in a large cap stock index fund such as the S&P 500. Stock market indexes such as this have been proven over and over again to be very effective for everyone from beginner to advanced investors. To illustrate this point, investment guru and billionaire Warren Buffett famously bet that an index fund would beat hedge fund managers after 10 years. Turns out he was correct! Over the long haul, stock market index funds produce returns of roughly 8 to 10% interest every year. To see for yourself, just check out the past performance stats on their Wikipedia page. Where could you find an index fund? Could you go for an even higher rate of return? Of course you could. There are other indexes and individual stocks out there that have produced greater year over year returns. But as you can probably guess, they also have a greater potential to LOSE money. Depending on your timetable for wealth building, taking such a risk may not be something you want to do. After reading that last section, you might ask yourself: Who wants to wait 40+ years to reach millionaire status? And I get it. You probably want to reach this goal as soon as possible. If that sounds like you, then there’s a very simple solution to this: Save more! Each dollar you save has the same compounding potential as the next. Therefore, it should make sense that the more volume of money you save, the more quickly you’ll reach millionaire status. To illustrate this point, look at what happens when you save all the way up to the U.S. IRS 401(k) maximum limit of $18,500 per year. Save and invest this much each year into a stock market index fund, and you’ll have the potential to reach the million-dollar mark within 19 years. Do you have a spouse who also works? If both of you can save up to the max, then you’ll get there in approximately 13 years! Okay. I get it. Maybe you’re thinking you and your spouse saving 2 x $18,500 = $37,000 isn’t in the cards for you. Of course, as we already said – less than 10% of people ever reach millionaire status. So then it stands to reason: If you want to accomplish something extraordinary, then you’ll need to be willing to do the things that most people can’t or refuse to do. We can never go back in time and start saving. But we can do something about it today. So don’t delay. Start the process of saving more NOW! The opportunities for saving more money is actually more abundant than people realize. All of the time, we’re making decisions that can and will drastically impact how much we spend on each and every transaction. Focus on reducing these transactions just a little bit at a time, and eventually they will build to bigger and bigger things! For example, think about your day today. Did you eat out did you eat breakfast at home or buy something along the way to work? Is your car vehicle a luxury brand or something more modest? Does it get good gas mileage? When you filled up the gas tank, did you go to the gas station with the cheapest gas or just any gas station? Did the gas station have some sort of rewards card offering you a discount for each gallon purchased? How about the credit card used? Does it offer you any rebates cash rewards for each purchase you make? What are the clothes you wear to work? Are they name brand designer, or something you bought from a discount store like TJ Maxx? Are they less than one year old, or clothes that you had for a while and kept in relatively good condition? What are you going to do for lunch today? Did you bring leftovers from the night before that you eat at work? Or will you go to the nearest sit-down restaurant and spend $10-$15? When you get home tonight, what are your plans? Are you going to talk with your spouse and maybe take in some Netflix? Or you have plans to go to an expensive restaurant or game? Want more ideas? I can think of literally one thousand more ways you could save more money. As you can probably tell, each and every one of these decisions can impact how much you spend. And if you spend just a little bit less on each one, the savings will start to add up really fast. Multiply that out times every day of your life, and you will begin to see how thousands if not millions of dollars are slipping out from underneath you. What can you do? Take notice of your lifestyle. Make an audit of all the things you spend on a monthly or even daily basis. Where does things seem to get excessive? Are there any cup ask that can be made or areas where perhaps you’re just too lax? The goal is never to strangle yourself financially by living like you’re poor. That would be like a person stops eating altogether just saw that he or she can lose weight. We know we all know how badly that ends! Instead, just like how proper diet is essential to your health, you need to be conscious of what lifestyle decisions you’re making and how those will affect your financial future. Saving more money is just one side of the financial equation when it comes to becoming a millionaire. 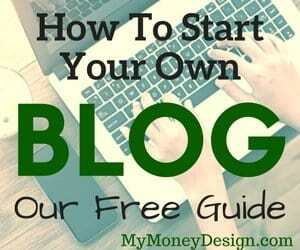 Another way you could speed things up is to start early more money too! Perhaps not as much as you may think. Earning more money is not something for the lighthearted or on ambitious. It takes a lot of effort and drive, even if it’s just a couple thousand dollars extra per year. The most obvious and probably the simplest place to look is your current job. Is there some position or extra projects you could take him which will earn you more money? Perhaps there is another position or promotion you could seek? Could going back to school and getting another degree help you transition into a higher paying position? If so, then you may want to consider weigh in the cost of both the tuition and the time it would take to achieve this goal. In some cases, they may not make any sense at all to stay at your current job, and to simply seek a more stable a higher paying one in a completely new field. 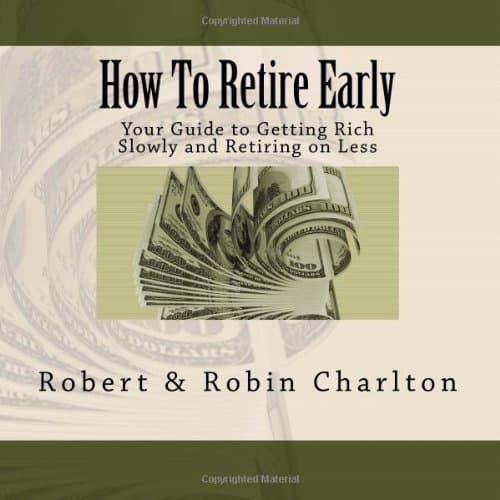 This is exactly what Robert and Robin Charlton did to get there, as explained in their incredible ebook How to Retire Early. Rob worked his way up to a higher paying position while his wife Robin changed occupations completely. This took them from making an average household income to upwards of $140,000 annually! Of course, no one ever said making more money has to only come from your job. Lots of people earn money on the side from any number of different side hustles and assets that they own. Take for example owning rental properties. Someone with one or two rental properties could likely easier late taken a couple hundred or even $1,000 net income per month. Own any dividend stocks? Dividend stocks are also classic form of passive income because you simply sit back and collect checks each quarter doing nothing more than owning shares of stock in a company. For a ton of other great passive income ideas, please check out our extensive list of ways to make money on the side here. The important thing to keep in perspective is that in all of the situations, you should never let lifestyle inflation ever creep up upon you. In case you don’t know, lifestyle inflation is when you tend to spend more money simply because you earn more. This is not something we want to do! Since our goal here is to save more, where anymore so that we can create a bigger delta between what we spend and what was safe. Is a Million Really What You Want? Even though becoming a millionaire would be an admirable accomplishment, its important to keep things in perspective. Namely: Do you really NEED a million dollars? Think about it. 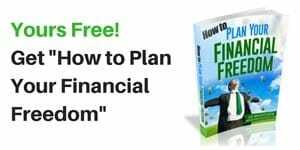 How much money do you really need to become financially free? For some people, the answer might in fact be much less than one million dollars. In fact, this was a question I wanted to explore so deeply, I wrote an entire ebook on the topic. The answer is just as unique as you are. Some people might need $5 million dollars to retire while others might only need $500,000. To give you a rough idea of how this all works, use this simple equation. Take the amount of money you think you will need each year for retirement and multiply it by 25. For example, if you said $40,000 per year would be enough to live on, then $40,000 x 25 = $1,000,000 would be fine. Remember: The goal, of course, is not to simply become a millionaire. 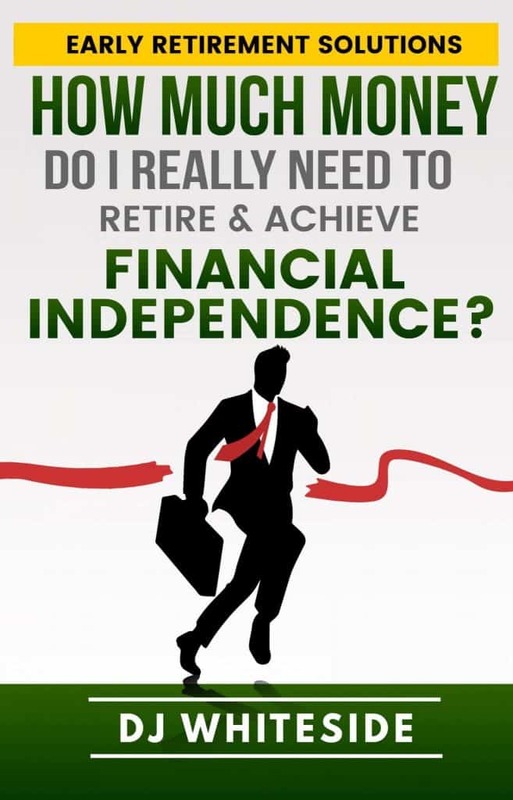 You want to become financially secure and happy for the rest of your life. Money is never actually the prize. Its what you do with your time as a result of having more of it that really counts. Readers – What are your strategies for becoming a millionaire? What tricks or methods have you used to safely accelerate your savings rate and build up towards your financial goals? How many of you have reached millionaire status? Tax Deferred vs Taxable Retirement Income Strategies, Take 2 – A Much More Substantial Difference! Average Retirement Savings Statistics – Really Scary Stuff!